Left: Regina Minorum Friary, Regina, Saskatchewan, 1932. Right: Headline from Western Catholic Reporter, 9 Sep 1931. 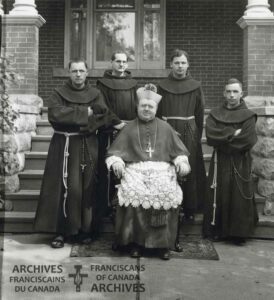 The decision to found a Franciscan friary in Regina, Saskatchewan, dates back to May 1930, when Archbishop elect James Charles McGuigan was on retreat with the friars in Edmonton in preparation for his episcopal consecration. It was at that time that he first mentioned his desire for a Franciscan presence in his future archiepiscopal city. Not long after, in 1931, the Franciscans purchased the former residence of the Archbishop at 2107 McIntyre street and the new Regina Minorum Friary was established. The first Franciscans in Regina were Fr. Celestine Demers, Fr. William Lavallee, Br. Joseph Rheaume, and Br. Eusebius Bousquet. The initial ministries included offering closed retreats, providing daily masses in French at the friary, and chaplaincy to French-speaking patients at the general hospital. Founders of Regina Minorum Friary, standing from left to right, Br. Eusebius Bousquet, Fr. Celestine Demers, Fr. William Lavallee, Br. Joseph Rheaume, with Archbishop J.C. McGuigan of Regina (seated). The Regina Minorum Friary would later serve as the home for the Regina Cleri Major Seminary in 1932, as well as become the headquarters for the new Commissariate of Christ the King in 1936.